Albert Paley, one of the world’s prominent metal sculptors, has collaborated with the City of Boynton Beach’s Art in Public Places on a new outdoor exhibit called, “Albert on the Avenue.” The national exhibit is an easy, self-guided walkable 30 minute tour along E. Ocean Avenue in the City’s Cultural District, and consists of six massive sculptures totaling 17 tons. Albert Paley’s descriptive commentary of each of his sculptures can be accessed via a smart phone connecting with a QR-code on each of the artwork plaques. In conjunction with Art Synergy, The Rickie Report shares the details and a sneak peek. All sculptures are available for purchase. Kudos to Debby Coles Dobay and her team for bringing this to our own backyard! Groups and organizations can arrange for structured tours. 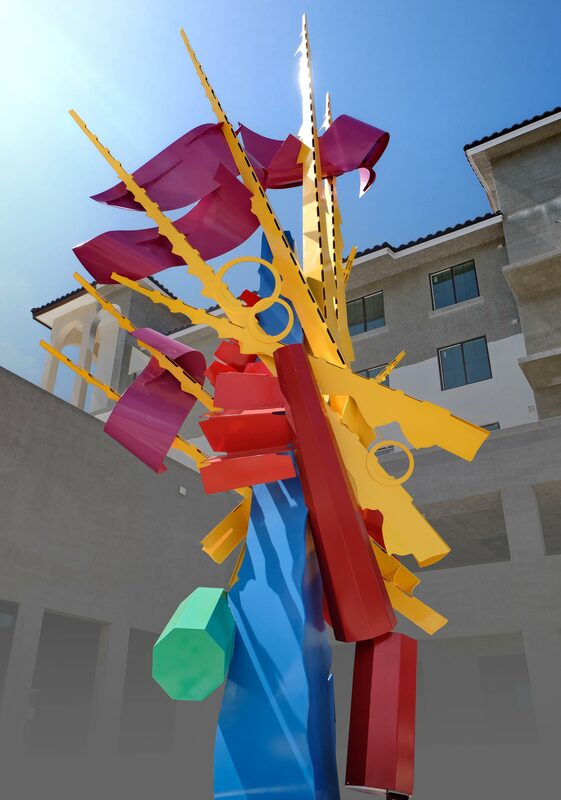 A colorful iconic sculpture, titled “Cavalcade”, reaches 40-feet into the sky, making it the tallest public art in the Palm Beaches. It is a permanent structure, commissioned by the developers of 500 Ocean. The five additional Paley sculptures are on are on loan for the yearlong exhibit ending in September 30, 2018 and are also available for purchase. Albert Paley: Albert Paley is an American modernist metal sculptor. Initially starting out as a jeweler, Paley has become one of the most distinguished and influential metal artists in the world. Paley is the first metal sculptor to have received the Institute Honors Award from the American Institute of Architects. A distinguished Professor, Albert holds an Endowed Chair at the College of Imaging Arts and Sciences at the Rochester Institute of Technology. Commissioned by both public institutions and private corporations, Paley has completed more than 50 site-specific works. Albert Paley’s body of work incorporating glass and steel is on exhibit at the Museum of Glass in Tacoma, Washington. About Boynton Beach Art in Public Places: Based on a public art ordinance the city adopted in 2005, the Art in Public Places program’s mission is to integrate the public artworks throughout the community. The program is funded through a one-percent public art fee. As new development occurs, public art is integrated into the architecture, infrastructure, landscape and greenways throughout Boynton Beach. To date there are 75 public and private artworks throughout the City of Boynton Beach. About the City of Boynton Beach, Florida: Boynton Beach is the closest point to the Atlantic gulf stream in all of North America earning the title, “Gateway to the Gulfstream.” Conveniently located in the heart of Palm Beach County, Florida Boynton Beach is easily accessed from 3 major airports and 2 major seaports. This coastal community runs parallel to a four-mile stretch of Intracoastal Waterway with access to the ocean via the Boynton Inlet. Even though it is the 3rd largest City in Palm Beach County, visitors can enjoy “Old Florida” charm with more than 253 acres of parks, a beach and natural conservation areas. Boynton Harbour Marina, CRA managed and City owned, offers a multitude of water activities including fishing and drift charters, diving, jet ski rentals as well as water front dining. From abundant shopping, dining and entertaining areas to historical preserved landmarks, vibrant public art, year-round unique events and its tropical weather, Boynton Beach is the place to be! Curated by Rolando Chang Barrero, The KeroWACKED® MultiMedia Festival presents: The #1 Outdoor Multimedia Event of Palm Beach County on Sunday, April 24, 2016 from 11am – 11pm at The Boynton Beach Art District. The Rickie Report shares the line up of 12 full hours of live music, readings, vendors, food and original art. Celebrate the Beat Generation! Artist Elayna Toby sees an interconnectedness of nature and human-made items that most of us miss. 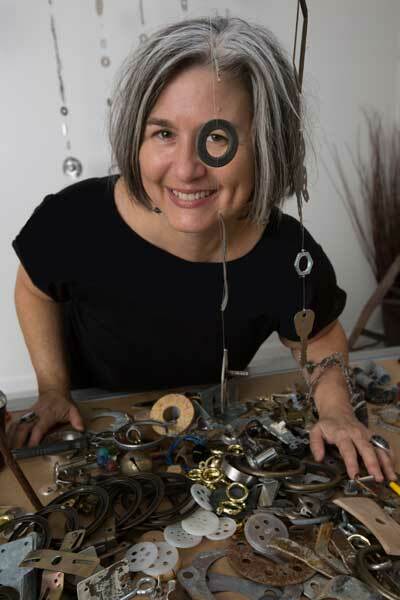 She started as a jeweler in the late 1980’s and has been creating mobiles since the mid 1990’s and incorporating “found objects” since 2003. She has had commissioned works and exhibitions throughout Palm Beach County over the past seven years. Her true joy is transforming ordinary objects into the extraordinary. Elayna Toby’s re-imagining and re-purposing brings us decorative kinetic mobile for the home and garden plus wearable sculpture! Her moving sculptures stir, sway and twirl outdoors in the wind – and indoors by the breeze of a fan or vent. Feel the freedom of the movement! The Rickie Report shares Elayna Toby’s journey to bring us “Art That Moves” just in time for the holidays. Here are some sneak peeks and the story of her journey. Elayna Toby Singer shares, “I am drawn to materials that come from the earth and to forms transformed through encounters with the elements. Presented in new contexts, each object’s intrinsic beauty is revealed. Balance and movement stir from the center connecting with our emotional, physical and spiritual core. Linking one object to the next, both physically and visually, awareness moves between root and crown. The space between reminds us to breathe. With each twirl and sound, energy shifts, spirit awakens, transformation occurs”. 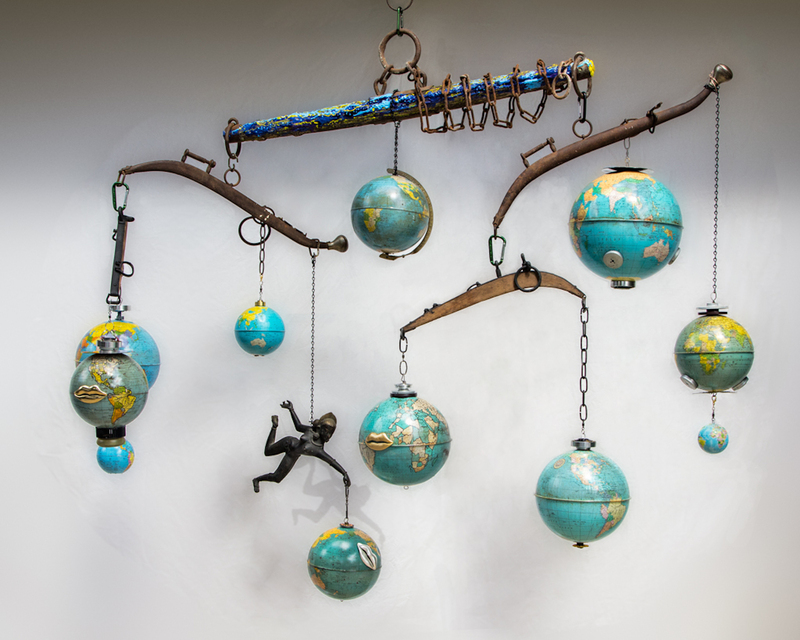 Over a year ago, as the City of Boynton Beach prepared for the 2015 International Kinetic Art Exhibit and Symposium, Elayna Toby’s vision for transforming an old kapok tree into a kinetic sculpture was percolating. For three days only, February 6-8, 2015, the tree was transformed into living kinetic art with 16-foot long, twirling strands bedecking its grand limbs. This magical community art project was honored with the “People’s Choice Award,” selected by thousands of attendees who voted on 14 outdoor showcased kinetic sculptures by artists from around the world. Elayna Toby conceived of “Kinetic Connections” as a way to encourage everyone to tap their inner artist, re-imagine everyday objects as art, and to join in on the transformative project. She held community workshops; provided County-wide drop boxes for contributed items; and ultimately combined the items with her own pieces to craft the thousands of objects into the kinetic strands. Selected from more than 100 International entries, “Kinetic-Connections” was featured as one of 25 Kinetic Projects in CODA magazine, being. The creative up-cycling, community art project Kinetic-Connections is still making an impact in the art world. The artist tells The Rickie Report, “During the Kinetic Art Symposium half of the 16 foot long strands were sold right off the tree. To celebrate “the season of light” and forthcoming New Year, the remaining strands from the kapok tree are being “Re-Imagined” into 4 foot strands with more embellishments, including additional mirrors which delightfully reflect and bounce the light. These new mobiles are now available in my online shop to add twirling happiness to one’s home or garden”. Recently inspired by a friend wondering what to do with the remaining “onesie” earrings after its match is lost or broken, Elayna Toby created “Excessories”, which invited the public to contribute their excess accessory pieces towards the original project. 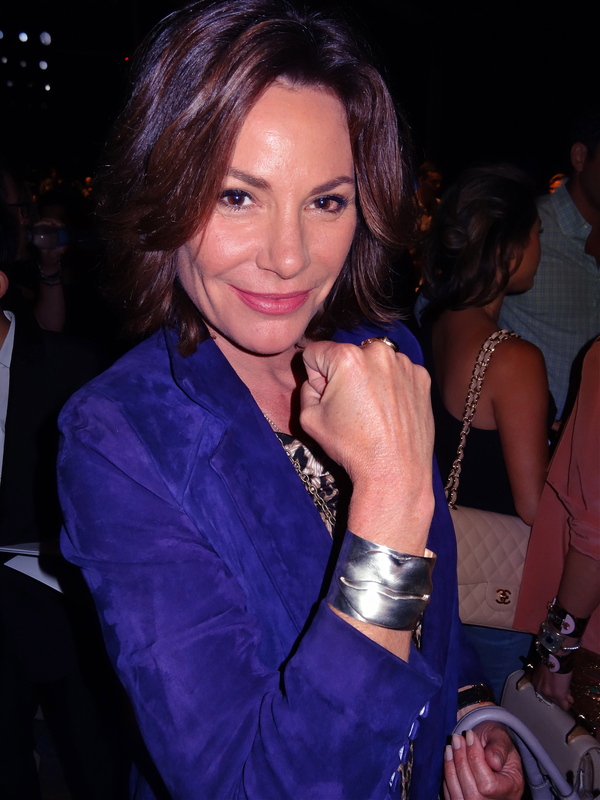 A percent of proceeds will benefit the development of the local fashion district in Palm Beach County. Elayna Toby continued her tradition of collecting “stories of stuff,” which provided a rich narrative for the individual pieces, and for the sculpture composition as a whole. She tells us, ” A tape measure from noted Worth Avenue designer Alfred Fiadace; a lapel pin in the shape of a submarine donated from the wife of a man who retired from the Navy – the stories are moving, whimsical and meaningful. Nearly 200 re-imagined pieces were combined into a rich composition of colors, textures and sounds. The individual “excessories” themselves include pieces by Roberto Cavalli and Versace, vintage couture, tools of the trade (spools, tape measures) and more. The results is a kinetic wall sculpture; a visual tapestry woven with the histories behind each piece. 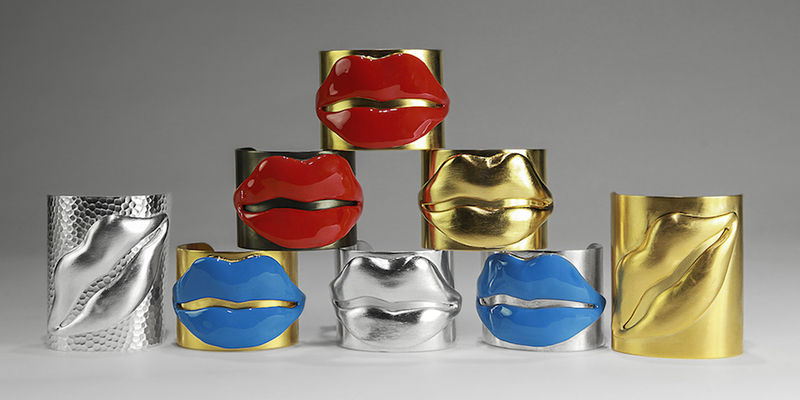 Elayna Toby began as a jewelry designer, fashioning her first kinetic piece as earrings. Her “aha” mobile moment happened when she was working at a botanical garden. Inspired by Mother Nature’s exquisite beauty, Elayna Toby collected fallen seeds and branches which she combined with beads to create her earliest kinetic works. 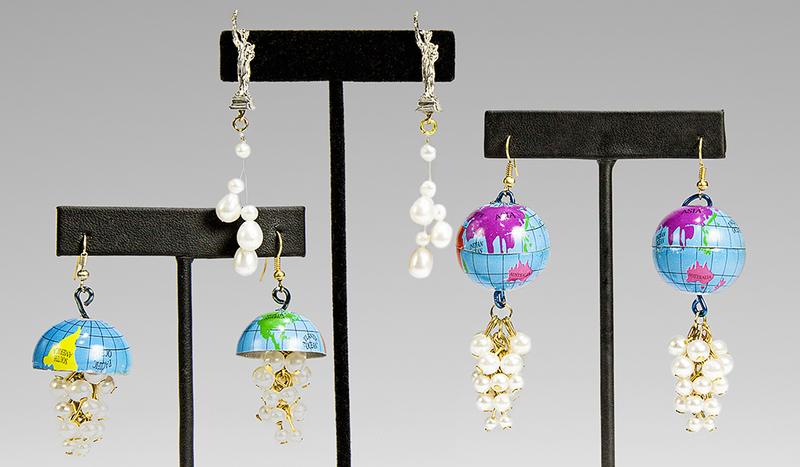 The journey continues today with her mobile kinetic earrings that express her passion for repurposing and creative reuse. 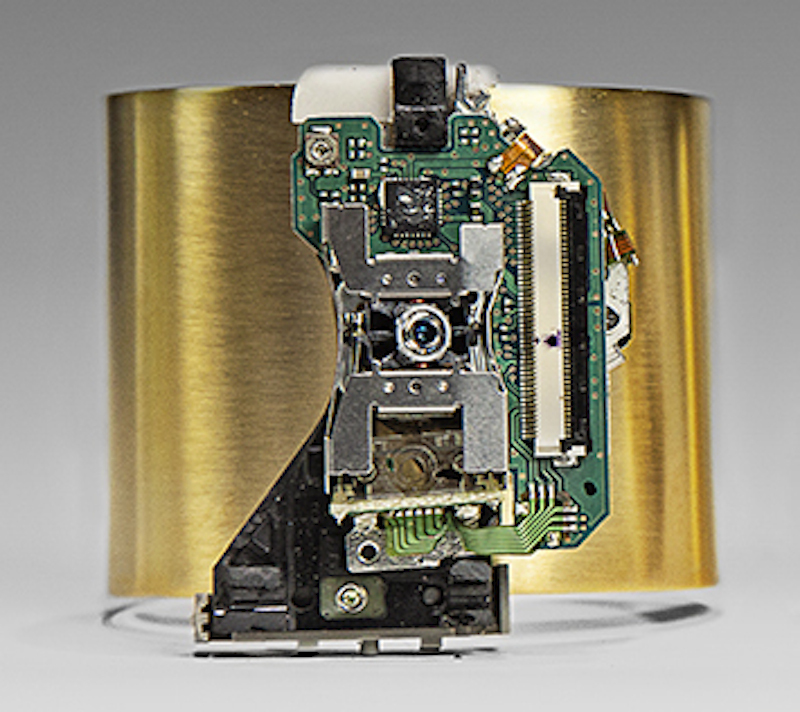 Elayna Toby uses only “cold connections” – no welding or soldering. She combines wrapping and knotting techniques, swivels and metal links, to connect one object to another. Re-imagined and re-purposed everyday objects are combined to extraordinary effect. All of her moving sculpture and kinetic jewelry are one-of-a-kind. “The “Wash & Wear” series features found washers I’ve collected, cleaned and cleverly re-imagined. Given that washers hold things together, stability and connection will come to all who adorn themselves with these wearable kinetic sculptures”. Necklaces, Bracelets, Earrings, Oh My! The natural properties and symbolism associated with each piece’s beads and metals infuses every Elayna Toby creation. For the bracelet set above, flexibility and strength, clarity and grounding properties ignite to alchemical effect. Take “unique” and “original” to a whole new level! Commission Elayna Toby to create jewelry or a mobile especially for you or someone you love. “International Kinetic Art Exhibition & Symposium” Boynton Beach, FL – Winter 2015; ARTPalmBeach, West Palm Beach, FL – Winter 2015; OSGS Gallery, Northwood Village, West Palm Beach, FL – Fall 2015; American International Fine Art Fair, West Palm Beach, FL – Winter 2014; “No Boundaries” Palm Beach State College Eissey Campus, Palm Beach Gardens, FL – Fall 2013; “International Kinetic Art Exhibition & Symposium” Boynton Beach, FL – Spring 2013; “Fashion ARTillery” Armory Art Center West Palm Beach, FL – Spring 2013; “Anatomy of Spirit” Studio 1608 West Palm Beach, FL – Winter 2012; Inspired West Palm Beach, FL – Winter 2012; “Evergreen” Gallery 110 East Delray Beach, FL – Spring 2011; 35th Annual Red Cross Designer Show House West Palm Beach, FL – Winter 2011 “Candlelier” shown hanging from the pergola as part of Terrace installation by Veronica Volani-Inza of Smith and Moore Architects, Inc.; “New*Art” Armory Art Center West Palm Beach, FL – Fall 2010; “Midtown Urban Arts Show” Midtown Commerce Center Ft. Lauderdale, FL – Fall 2010; “Ecology Art at the Gardens” Ann Norton Sculpture Garden West Palm Beach, FL – Spring 2010; 34th Annual Red Cross Designer Show House West Palm Beach, FL – Winter 2010 “Inner Flame” shown as part of Eco-Lounge installation by Veronica Volani-Inza of Smith and Moore Architects, Inc.; “Right Here, Right Now” Studio 1608 West Palm Beach, FL – Spring 2010; “VISIONS+” Studio 1608 West Palm Beach, FL – Fall 2009; “Shades of Green” Meyerhoefer Gallery Lake Worth, FL – Summer 2008. Follow links for Elayna Toby news…. Kinetic-Connections, WPTV, February 2015; Kinetic-Connections, Extra Step, February 2015; Kinetic-Connections, Boca Magazine – Backstage Pass, page 154 – February 2015; Kinetic-Connections, Boynton Beach Forum – On The Spot, page 8 – February 2015; Kinetic-Connections, Palm Beach Arts Paper, February 2015; Kinetic-Connections, Boca Magazine – Moving Sculptures, February 2015; Kinetic-Connections, The Coastal Star, February 2015; Kinetic-Connections, Sun-Sentinel, January 2015; Kinetic-Connections, The Palm Beacher, December 2014; Kinetic-Connections, WPTV, November 2014; Kinetic-Connections, Boynton Beach Forum, page 5 – November 2014; Kinetic-Connections, Palm Beach Post, November 2014; Kinetic-Connections, Palm Beach Gardens & Jupiter Florida Weekly, Nov. 2014; Kinetic-Connections, Sun Sentinel, October 2014; No Boundaries, Palm Beach Arts, October 2013; Bob Villa Highlights Elayna Toby Art, 2013; Traditional Home Magazine, March 2012; American Red Cross Designer Showcase, Palm Beach Daily News 2011; “Ecological Aesthetic” Palm Beach Daily News – 5/10/10; Visions+ Studio 1608, Examiner.com 12/2/09; Visions+ Studio 1608, Palm Beach Arts Paper – 11/27/09; Natural Object Mobile Workshop in Merida, Mexico – 8/2/09; Shades of Green, Meyerhoefer Gallery – 7/26/08. Who designed and created the world’s largest stained glass window? 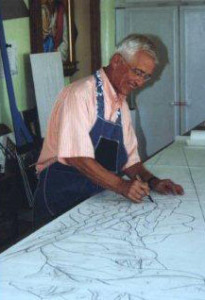 Conrad Pickel, the resident and designer of numerous buildings in Boynton Beach, FL! 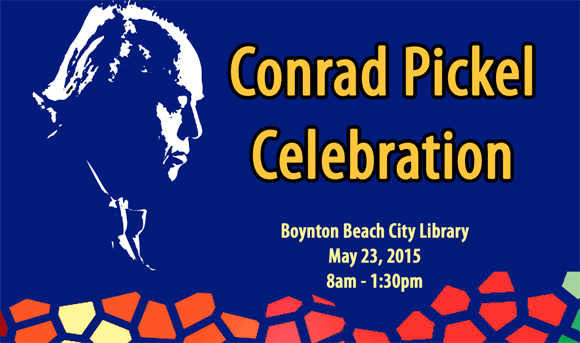 Come and celebrate the legacy of Conrad Pickel on Saturday, May 23rd. A major influence within the stained glass industry in the United States, he was a gifted painter, wood carver and mosaic artist. The Rickie Report is excited to share the details about this event. There will be bus tours, lectures, and demonstrations by experts in glass making and stained glass. Meet the family living in one of the homes he designed! Be part of Florida’s heritage-tourism and be proud! These events are Free to the public, but you must register for the bus tour. 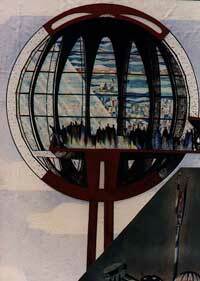 Conrad Pickel (1906 – 1994) learned the art of stained glass with the renown Mayer Studio in Munich, Germany. He opened his own studio in 1947 in Milwaukee, WI, which quickly grew into one of the leading studios in the United States. In 1956, Mr. Pickel opened a branch in Vero Beach, Florida and transferred the complete operation there in 1977. Mr. Pickel lived in Pompano Beach, FL. 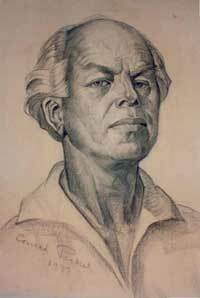 and moved to Boynton Beach, FL in 1956 until his death. He designed five buildings in Boynton Beach. The tour will depart at the Boynton Beach City Library, 208 S. Seacrest Blvd. at 8 a.m. 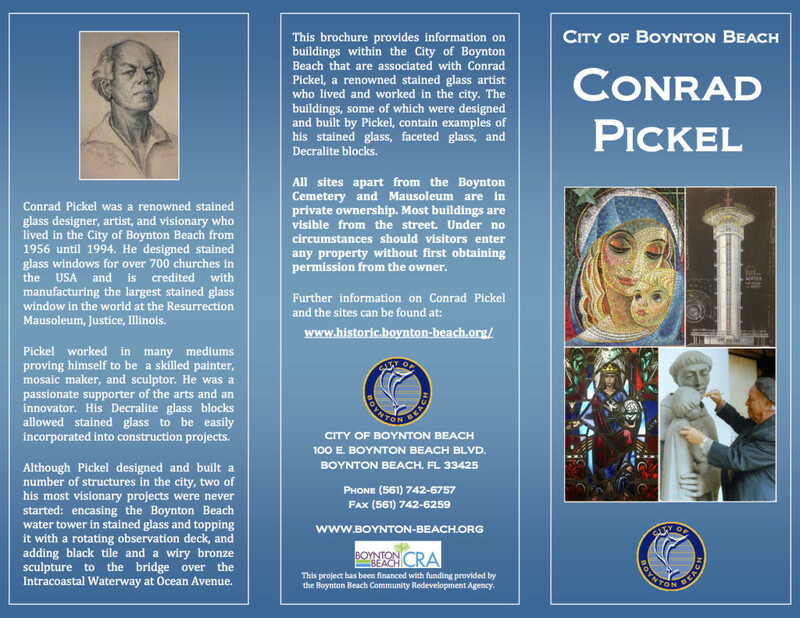 The tour, which will be narrated by City of Boynton Beach Historic Preservation Planner, Warren Adams, and President of the Boynton Beach Historical Society, Janet DeVries, will visit 5 locations that highlight Conrad Pickel’s stain glass pieces: Boynton Beach Memorial Park Mausoleum, Ascension Lutheran Church, St. Joseph’s Episcopal Church, Former Gallery Fantasia, and St. Mark’s Church. The tour is free. However, interested attendees must call 561.742.6066 to register. On completion of the bus tour, at approximately 10:30 a.m., the program will begin at the Boynton Beach City Library, 208 S. Seacrest Blvd. with a series of lectures on Conrad Pickel by Janet DeVries, President, Boynton Beach Historical Society; Shanon Materio, President, McMow Art Glass; Paul Pickel, President, Conrad Pickel Studio; Rick Eggert, Creative Director, Benzaiten Center for the Creative Arts and the Jacarusos, owners of a Conrad Pickel designed house. 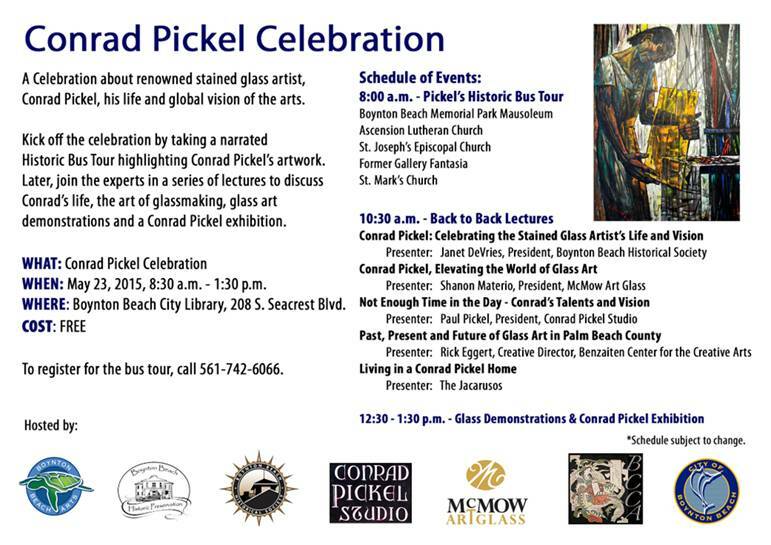 In addition, there will be glass art demonstrations and an exhibit of Conrad Pickel’s art, vision and dreams. A major influence in the stained glass industry in the U.S., Pickel invented decralite block. His appreciation for how glass could transform simple concrete blocks can be seen at his most well-known structure in Boynton Beach, Gallery Fantasia. He incorporated faceted glass in the blocks which were then used as structural elements in the 1960’s, 1970’s and 1980’s. 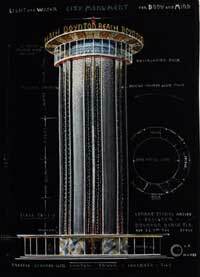 Mr. Pickel’s designs to make a simple water tower a piece of public art were embraced by the City Of Boynton Beach. We share one of the images here. Their construction was unable to be completed due to budget issues. 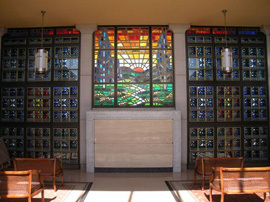 Under the direction of Mr. Pickel’s son, Paul, the studio continues to develop new techniques and applications for stained glass and mosaic. In addition to a presentation by Paul, the community will meet the Jacaruso family, who lives in the home constructed by Conrad Pickel located in Pompano Beach, FL. The Pickel Studio with more than a half-century of commissions to its credit, continues to create innovative stained glass, mosaic and sculpture for religious, secular and public projects throughout North America. 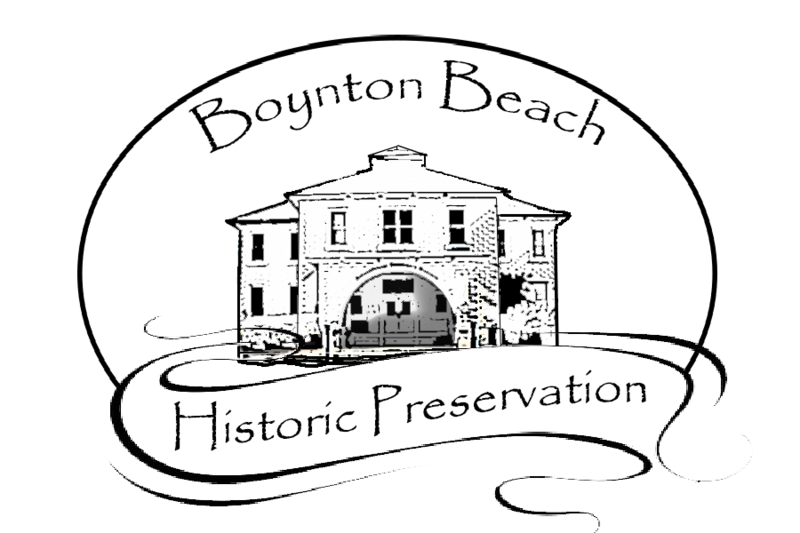 The City of Boynton Beach recognizes the importance of preserving its historic resources and has adopted a preservation ordinance as the foundation for a comprehensive preservation program. The program is to include a Historic Resources Preservation Board for program oversight; a property tax exemption component; and guidelines, standards, and procedures for the maintenance and modification of historic properties. The City has also initiated a community education campaign to inform the public of the value of historic preservation, the aforementioned tax exception program, and how historic preservation can be a tool for stabilizing aging neighborhoods, fostering community cohesiveness and furthering civic pride. Alexandre Dang, a French solar kinetic artist who currently lives and works in Brussels, Belgium, will conduct a series of FREE, creative workshops for children and their parents during the International Kinetic Art Exhibit and Symposium, Feb. 7-8, 2015, in Boynton Beach. During the one hour workshops, which will be held both days at 11 a.m. and 1 p.m., at the Schoolhouse Children’s Museum and Learning Center in downtown Boynton Beach, Dang will lead participants in constructing dancing solar butterflies that they will attach to solar mechanisms and place in the museum’s courtyard. The goal of the workshops is to teach those who take part about solar energy and how they can conserve it. The Rickie Report shares the details and how to PRE-REGISTER for this FREE Event! ART LOVERS and ART PATRONS: Mark your calendars NOW for the International Kinetic Art Symposium in Boynton Beach, Fl! Alexandre Dang, a French solar kinetic artist who currently lives and works in Brussels, Belgium, will conduct a series of FREE, creative workshops for children and their parents during the International Kinetic Art Exhibit and Symposium, Feb. 7-8, 2015, in Boynton Beach. During the one hour workshops, which will be held both days at 11 a.m. and 1 p.m., at the Schoolhouse Children’s Museum and Learning Center in downtown Boynton Beach, Dang will lead participants in constructing dancing solar butterflies that they will attach to solar mechanisms and place in the museum’s courtyard. The goal of the workshops is to teach those who take part about solar energy and how they can conserve it. To preregister for the workshops, which include instruction and a Certificate of Completion signed by Alexandre Dang, email suzanne@schoolhousemuseum.org. For those who don’t preregister but still wish to make a dancing solar butterfly, they may do so with the guidance of museum staff anytime during the event weekend. To see past workshops, visit http://tinyurl.com/po2a89c. To see prior exhibitions, visit http://tinyurl.com/o7pf7qz. Dang will also conduct workshops at Galaxy E3 (Engineering, Energy, Environment) Elementary School in Boynton Beach on Friday, Feb. 6. Students there will also create dancing solar butterflies that will be added to the exhibit at the Schoolhouse Children’s Museum and Learning Center. Both the school and the museum are excited to bring this valuable workshop to their facilities as it aligns with their S.T.E.A.M., Science, Technology, Engineering, Art and Math programming. Created by the Boynton Beach Arts Commission and produced by the City of Boynton Beach Art in Public Places program, the International Kinetic Art Exhibit and Symposium is a biennial event held in downtown Boynton Beach that is free and open to the public. Its purpose is to connect the public to one-of-a-kind visual experiences. The event features both indoor and outdoor iconic works of kinetic art, educational presentations and the opportunity to meet an array of international kinetic artists. Other components for 2015 will include the first “Kinetic Connection,” a community based kinetic artwork, and a Solar Tree student kinetic art exhibition. This event is supported by Equity One, Inc., Kinetic Art Organization (KAO), International Sculpture Center, Cultural Council of Palm Beach County, Buffalo Wild Wings, Boca Bearings, and Hacklab. Other sponsors include Solartree Project, Coastal Star, Neighborhood Gallery, Schoolhouse Children’s Museum and Learning Center, The Secret Garden Cafe and the Boynton Beach Community Redevelopment Agency. Additional sponsorship opportunities are available by contacting Debby Coles-Dobay at (561) 742-6026. For more information on the 2015 International Kinetic Art Exhibit and Symposium, call (561) 742-6026, email ColesDobayd@bbfl.us or visit IntlKineticArtEvent.org. In addition, The Rickie Report shares the results of the “Focus on Planning” Photo Contest, which youth and adults participated. The winners of the Focus on Planning Photo Contest were announced by Mayor “Jerry” Taylor. The photo contest was held to commemorate National Community Planning Month and recognize urban design features within the City limits. 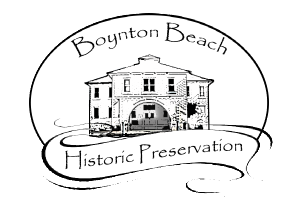 Photographs must have captured Boynton Beach’s distinctive architecture; its urban designs, cityscapes, landmarks and/or structures. Boynton Ballerina showcases the structures at the Promenade Park, a high level streetscape along Boynton Beach’s waterfront. The shot captures the versatility of Las Ventanas, a unique mixed-use living environment combining livability and colorful aesthetics. This photograph depicts a Class A resort-style condominium property and its waterfront feature, which is one of its stronger selling points. This picture shows Galaxy E3 Choice School, dubbed the greenest school in the galaxy, one of the buildings that best represent efficiency and sustainability in the City. “I was impressed by the participation of both local photographers and voters, and anticipate even greater involvement next year. 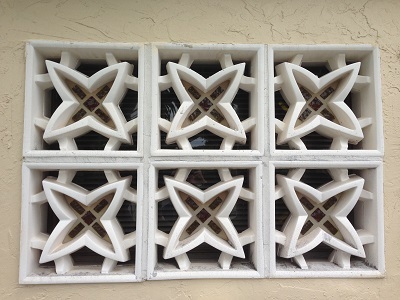 Our City is so fortunate to have many distinctive architectural structures; having a photo contest was a unique way to artistically capture attributes of Boynton’s built environment,” said Mike Rumpf, Director of Planning and Zoning. 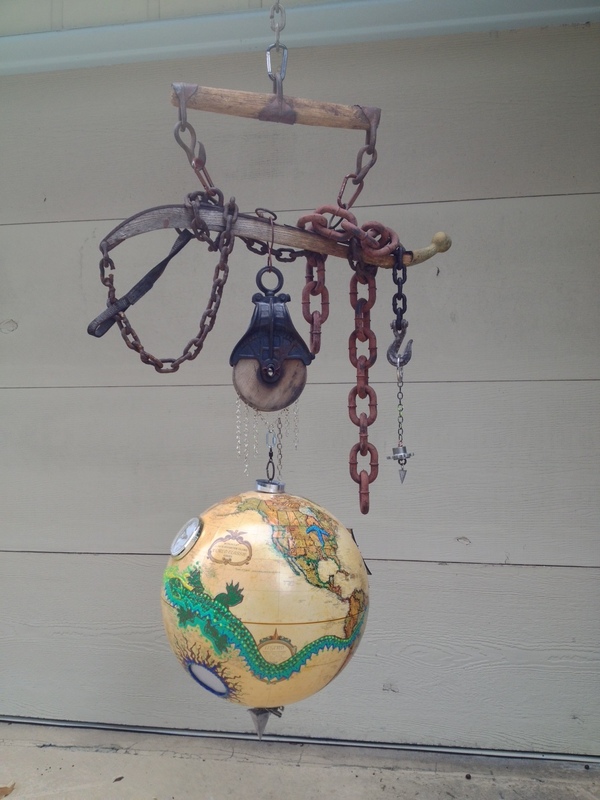 Transform a Majestic Tree into a Kinetic Sculpture with Up-Cycled Items From YOU! Empty your junk drawers, office & garage. Invite new possibilities for 2015! Sample items to up-cycle into art… keys ⊕ curtain or napkin rings ⊕ hardware ⊕ bells pieces of jewelry ⊕ small house wares ⊕ buckles ⊕ auto or computer parts ⊕ etc. Before you drop off your stuff at one of the Up-Cycle Drop Boxes do a brief (30-seconds) video selfie talking about the items you’re contributing. Please state your name at the beginning of your selfie. Perhaps you wish to share, why you want to up-cycle your stuff & be part of this community art project? *A portion of proceeds will benefit the City Boynton Beach’s Art in Public Places program and Resource Depot. “The Show Must Go On” is normally associated with theater. In the midst of dealing with the devastation of the Boynton Beach Flood and injury, Rolando Chang Barrero put aside an important document. The ARTalFRESCO satellite exhibit was one the biggest efforts by Rolando to highlight the City of Boynton Beach’s art scene and was a pillar of Art Synergy’s premiere. The Rickie Report shares the details of the document and invites everyone to gain a better understanding of the role of art in our everyday lives. We include a number of events that you will not want to miss! While dealing with the devastation of the Boynton Beach Flood, a brown envelope was put aside to be opened at a later moment. The manila envelope was stacked among the many “get to it later” correspondence that did not look like a bill. At the time cleaning up and preparing for the ARTalFRESCO Exhibition was paramount, it was only days away–and the show must go on. The ARTalFRESCO satellite exhibit was one the biggest efforts by Rolando Chang Barrero to highlight the City of Boynton Beach’s art scene. Busy with the cleanup, the exhibit, an injury to his left hand, and fundraising for the losses incurred by the flood, the envelope remained unopened. After all was said and done, in a moment reprieve from the madness, the letter from the U.S. House of Representatives in Washington D.C. was opened. The Honorable Alcee L. Hastings had penned a glowing letter of recognition to local artist and arts administrator, Rolando Chang Barrero, for “The wonderful work teaching the students of Manatee Elementary the importance of recycling and showing them how to turn trash into art.” The Congressman’s letter which came as an unexpected surprise, “Brought tears to my eyes,” says Barrero. Rolando who is no stranger to motivating the community through his art is participating in “ELEMENTS”, a three man exhibit on the importance of safeguarding South Florida’s Eco-system. “ELEMENTS” includes work by Greg Matthews, Rolando Chang Barrero and Anthony Burks, Sr. at the City Library on Boynton Beach, all are invited to the reception on February 13, 2014 from 5:30-7:30. The South Florida ecosystem relies heavily on elements which surround our wildlife and impact our daily lives. From the aquifer to coastal waters, from everglades to beaches, from hurricanes to flash fires, we experience our environment in its natural habitat. Greg Matthews, Rolando Chang Barrero and Anthony Burks,Sr. In this exhibit three artists Rolando Chang Barrero, Anthony Burks Sr. and Greg Matthews highlight the importance of the environmental conversation movement in South Florida. Collectively, the artists engaged in conversations and site visits with leaders of conservatory organizations throughout South Florida. They observed, documented and processed their images and experiences. The artists created three collaborative artworks which are the centerpiece of the Elements exhibition. Each artist contributed his medium to the collaborative artworks: Rolando, painting; Anthony, drawing; and Greg, photography. The collaborative artworks are not only esthetically pleasing but have great social impact. Each artist also has several individual artworks exhibited to demonstrate their medium and commitment to environmental issues. This exhibition supports and builds upon the City of Boynton Beach’s GREEN programs including Earthweek activities, Climate Action Plan, Galaxy E3 Elementary School, Seaborne Cove and its Old Dixie Eco Walk. It is hoped is that visitors will have a deeper appreciation for the South Florida’s ecosystems by experiencing this exhibition. Later this month Rolando will be joining Lori Durante, organizer of Children & Family Day, to produce a puppets and puppet show with children on the importance of fresh fruit in their daily diet. The theme for the the annual event is ‘Apples.’ Children & Family Day is held at the Boynton Beach Women’s Club, on February 23, 2014, noon to 4 p.m.
With work in multiple venues, including a SOLO show, artist Vicki Siegel has been pouring her creative energy into new work and organizing a SOLO exhibit with a range of work from the last ten years. Her paintings include images of both collective and personal memories. The Rickie Report is pleased to share the details of her exhibits and hopes you will stop by to view some of her wonderful, dreamlike creations. Vicki Siegel’s paintings are informed by memory, both personal and collective. “Memories are imperfect representations of the past that are altered, fragmented, reconstructed and reinterpreted over time” says Siegel. “In my narrations details are found in layers often revealing something forgotten or missing from actual experiences or by the collective memories we share”. In her first SOLO show, “Journeys”, artist Vicki Siegel takes the viewer on an artistic journey from the outside world to a world that exists in the imagination. 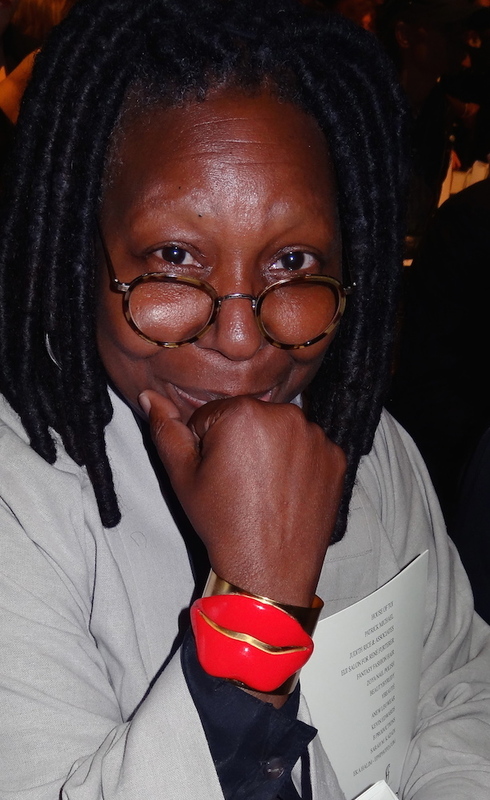 The exhibition takes place at the Weisman Delray Community Center, January 21, 2014- March 2, 2014. The Center is located at 7091 W. Atlantic Ave. in Delray Beach. Hours are Monday – Thurs. 9 am – 5 pm, Friday 8:30 am – 4:30 pm. A reception with a brief artist talk will be held Sunday, February 16th from 2-4 pm. Free and open to the public. Call 561-558-2100. “Journeys” runs January 21, 2014- March 2, 2014. With over twenty five paintings on display, from landscapes to figurative, these colorful works of art reflect the artist’s focus on both the spiritual and natural worlds. Many have a dreamlike calming atmosphere. Expressive use of acrylic paint with overlays of pencil, charcoal, and oil stick drawing, along with image transfers of photographs will delight the viewer. A portion of the sales will benefit The Weisman Delray Community Center. It is part of the Ruth Rales Jewish Family Service. The Center is located at 7091 W. Atlantic Ave. in Delray Beach. Call 561-558-2100 for more information. Ruth Rales Jewish Family Service (JFS) offers help, hope and humanity through a comprehensive range of programs and services which support people of all ages and beliefs. With locations in Boca Raton and Delray Beach, JFS programs and services include food and financial assistance, senior services, counseling and mental health services and many volunteer opportunities. Funding is provided by private and corporate support, grants, special events and individuals who reach thousands in need each year. For more information, contact 561-852-3333 or visit www.ruthralesjfs.org. Don’t miss the chance to see Vicki Siegel’s brand new work at Art al’FRESCO. Rolando Chang Barrero, owner of ArtistActivistA Gallery, invited Vicki Siegel to exhibit at ART al’FRESCO on Friday January 24. 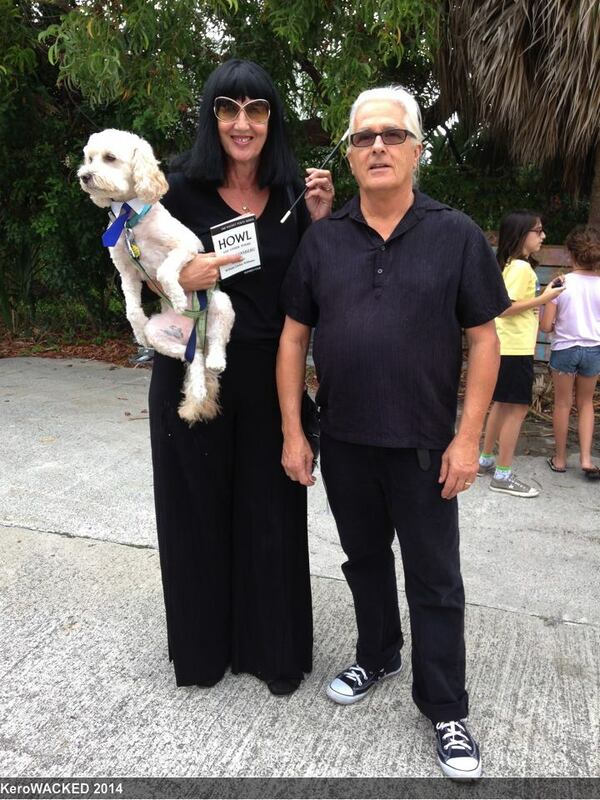 ART al’FRESCO is a part of Art Synergy which are six satellite exhibitions for ART PALM BEACH 2014. Hosted by the Boynton Beach Arts District (BBAD), ARTal’FRESCO is a one night art, fashion and cultural exhibition which will feature unique art experiences at BBAD, including live, interactive painting in artist’s studio settings; plein air painting; contemporary sculpture installations; a glass blowing demonstration; painting and photography exhibitions; and video projection. Participants will be entertained by the South Florida Symphony Brass Ensemble; Illuminated Performance by Philosiphiers; Fusion: Fashion and Art’s Living Sculptures and graffiti artists painting on “ActivistArtistA Bay Gates” doors and walls.